As we go deeper into the digital age, more and more people get access to a growing number of technological innovations. With computers, smartphones, and tablets becoming increasingly widespread, the software application development industry, which creates the software that powers all of these devices, becomes more and more in demand. In as early as 2013, an estimated $542 billion was spent on software globally, according to market research firm Forrester. With the software industry continuously growing, software development is becoming a progressively competitive industry, and a number of software development practices have emerged to ensure that businesses in this sector remain on top of their game. In this article, we take a close look at agile development, one of today’s most effective methods of software development. The classic software development methodology was known as the waterfall model. Originating from the construction and manufacturing industries, this method involves a linear process of software development. It begins with the extraction of the full requirements of the software project and a linear plan of the order of development tasks. Once a complete plan has been laid down, the development tasks are then worked on in sequence. After all the tasks have been completed and tested, the finished product is then evaluated by the client for acceptance. This method is very simple to implement but is prone to failure due to its rigid structure. Unlike the manufacturing and construction industries, software development tends to be more dynamic in its requirements. When an undesirable behavior is detected by the client during evaluation, or when changes in requirements prop up, modifying the software to correct these features will likely require another cycle of software development. This can lead to a quick pile-up of costs that were originally unplanned, which can lead to failure for many projects. Agile software development aims to solve these problems by providing a model that gracefully handles changes and minimizes their impact on resources. Formalized in 2001, the details of the agile methodology are described in the Manifesto for Agile Software Development, a document jointly produced by seventeen software developers based on their experiences on the best approach for software development. Developer and Client Collaboration – Whereas with the waterfall model, the client is only involved at the beginning and the end of development, the agile process encourages that the client and developer communicate on a daily basis to make sure that they are constantly on the same page. Simplicity is Always Favorable – With the agile model, a simple solution is always favored over a complex one. In this way, one primary consideration is to minimize the amount of work that is done by the agile development team. According to VersionOne’s 2017 State of Agile Report, as of 2016, 94% of all surveyed respondents reported that their organizations practice the agile methodology in their software development process, with over 57% of them having implemented the methodology for 3 years or more. Moreover, 98% of organizations who practice agile development claimed that the method has caused success in their software projects. There are a number of specific methods that use the agile process. Here are some of the most popular ones used by organizations. By far the most popular agile method is the Agile Scrum, a software development framework created by Jeff Sutherland and Ken Schwaber and is used by 58% of all organizations implementing agile development. In this framework, development is done by teams of 3 to 9 developers, called scrum teams, in fixed development cycles, each of which is called a sprint. Agile Scrum also requires 15-minute daily meetings, called Scrum meetings, as well as time-boxed planning, retrospective, and sprint review meetings within a sprint. Kanban is a visualization method that helps give development teams a better overview of the development tasks and the possible sources of bottlenecks. This method typically makes use of a Kanban Board, where individual tasks are posted for everyone to see. Extreme Programming is a methodology that implements a set of rules that must be followed in order to ensure the success of an agile project. For instance, it requires that all codes have unit tests, and that these tests must be coded first before the actual functionality. It also recommends that developers be moved around so they can familiarize themselves with the different aspects of the software. Note that these methods need not be implemented in isolation, and it is in fact common practice to combine these methods. For instance, the 10% of agile organizations implement a hybrid of Scrum and XP methodologies, while 8% use Scrumban, a hybrid of Scrum and Kanban. With agile development effectively facilitating successful software projects, it’s unsurprising that the demand for agile developers continues to rise. According to ComputerWeekly, for instance, in the United Kingdom alone, the demand for agile practitioners has doubled in 2012 compared to 2010 in terms of job postings on their job board. According to VersionOne, among the top reasons why organizations adopt the agile process are that it accelerates delivery of products, it effectively enables adaptation to changes, and it increases overall productivity. An agile development team may be composed of members having different roles. An agile developer, for example, is a core member who writes the actual code for the software. The most important among the agile developer responsibilities is for the developer to have a thorough knowledge of all agile guidelines, as well as the agile tools being used by the organization, such as the Kanban board. A good agile developer should also be effective in working and collaborating constantly not only with agile software development team members, but also with clients. Another possible role within an agile workforce is agile project management. A good project manager for an agile software project should be able to effectively implement all the rules and guidelines of the agile method being implemented. In doing so, he is able to ensure that the benefits of the agile process are maximized. An agile expert or consultant may also help with the implementation of the agile process within an organization. Such an expert should be fully knowledgeable in all the different agile methods, and can recommend which ones to use based on the business environment of a company. For such a role, it may help to acquire an agile developer certification from one of the many organizations that grant them. 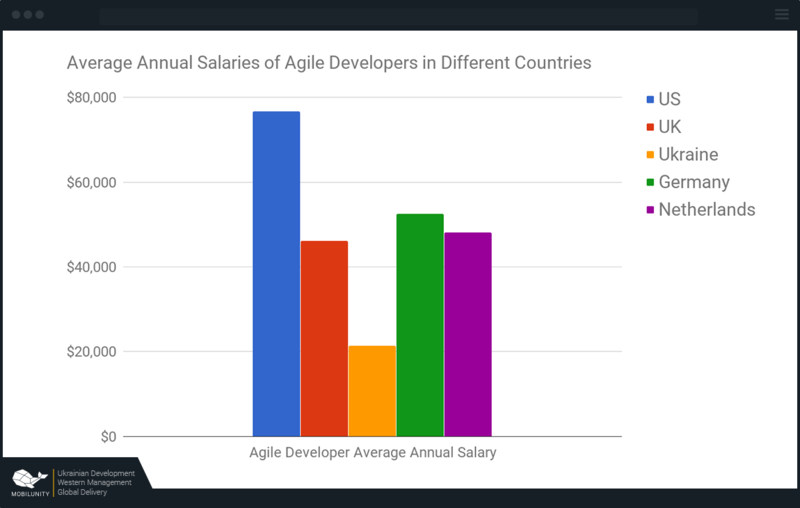 From the above figure, it’s evident that Ukraine offers the most affordable rates for agile developers. Here’s an example of an actual agile developer resume to give you a better picture of the usual skills and experience of an agile developer. The agile methodology has dramatically improved software development processes across organizations, resulting in the wide adoption of this process worldwide. We’ve seen the benefits of agile, the different agile methods you can choose from, and some tips on how to look for the best agile developers. If you’re in the market to introduce agile into your business, we’re here to help! We at Mobilunity provide the most highly skilled dedicated developers who have extensive experience with various agile development methods. Located in Ukraine, we offer to hire remote developers at one of the most affordable rates you can find, so you’re assured to get the best value for your money. Contact us now and let’s boost the productivity of your business!